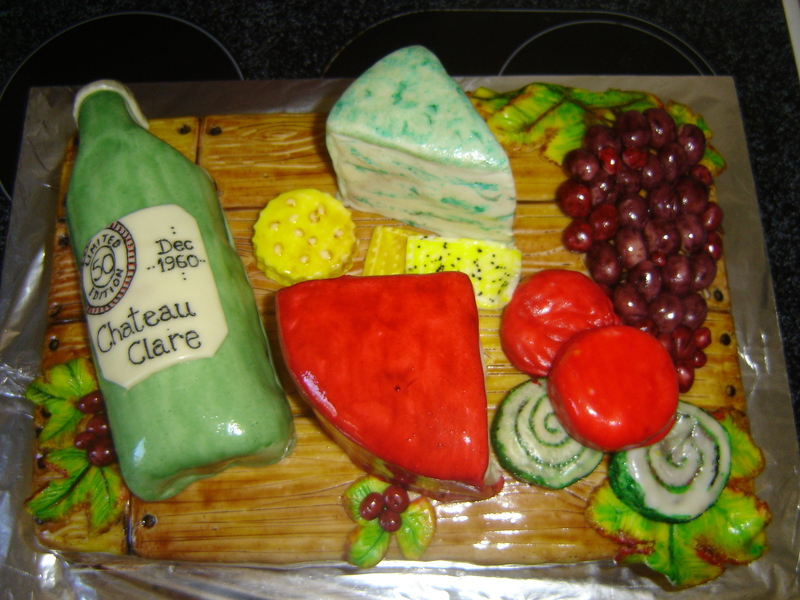 This was for a friend for her 50th birthday..Clare is very into making her own cheese (which by the way is fantastic!) so this was my offering to her a cheese board cake.. Everything is edible..I really enjoyed making this. It was all hand painted …no special tools…just knives, spoons, the end of icing nozzles (to make the screw heads in the cheeseboard) and a bit of food colouring (and vodka to mix it so it goes further and dries better). This is not really “butter” but have no idea what you would call it…jam maybe but not really..anyway as my husband said …it looks a bit like sump oil (charming!!!) but if you like something a bit different then this is lovely…goes really nicely with cheese and crackers. Pop it all in a pan and then bring to the boil..turn down to a low boil and leave for about 45 minutes stirring frequently. It should be gloopy (technical word there!) by this time …pop it into sterilised jars. I made Ricotta from the whey I gathered from the two cheeses I made..this morning it was well and truly drained but still lovely and moist. I would love to say I left it overnight on purpose but truth be known I forgot about it last night!!! LOL !!! I made Ricotta last week with my other cheeses but this time I tried leaving the whey for 24 hours (rather than adding vinegar to acidify it) as I had read somewhere that acidifying it this way gives a smoother cheese…well it was right. Adding the vinegar and making it straight away resulted in quite a grainy cheese – leaving it 24 hours produced a much nicer, smoother cheese….so that’s the way to go in the future. So as an exercise just to see how efficient making our own cheese is from a cost point of view I had a little look about…..
What I’ve been doing for the last few days (other than working) …well been making more cheese…I have a new pass time at the moment…now I’ve discovered that it’s not as scary as I thought it would be I’m on a roll!!! 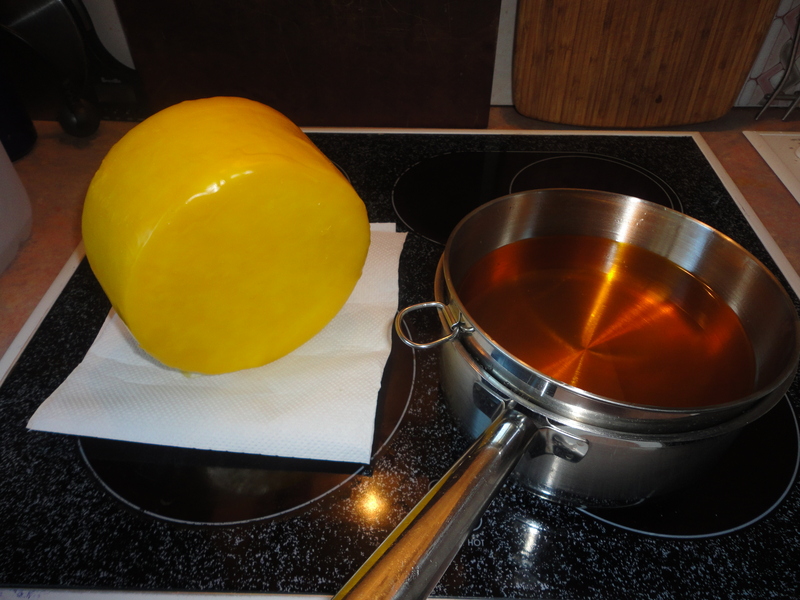 So I now have a Cheddar type cheese maturing (the one I made last weekend) in it’s wonderful wax jacket and in addition 2 Gouda’s maturing in the fridge and another Cheddar sat in the press ( will be out tomorrow to go and air dry). It’s a fascinating thing to do…and I have cheeses…they look like cheeses anyway….now we’ve just got to wait until they’ve matured to find out if they taste like cheese. The one thing I am learning (other than making cheese obviously) is patience ~ with this new process for me it’s all very exciting while you are making it but then it all comes to an abrupt halt and you have to wait….no choice in the case of cheese.